Trust your teeth to a professional dental team that provides top dental services in Raleigh. We have experienced staff that is dedicated to the optimal oral health of every patient under our care. Our specialty is family dentistry, and we tailor our dental services to the individual needs of patients both young and old. We also offer emergency dental care for your convenience. Everyone deserves to have access to the best dental care, regardless of their financial situation. As a family dentist that strives to serve all patients who come to us, we ensure our dental services are affordable for everyone. Our commitment to providing top dental care at the most affordable prices is what makes us the number one local family dentist. In addition to maintaining very competitive rates, we also have a number of special discounts to help our patients save even more. Those interested in teeth whitening and other cosmetic procedures should ask about our special offers. You can expect to receive outstanding dental care from highly skilled dentists while staying within your personal health budget. From emergency dental procedures to routine checkups and cleanings, our office is equipped to accommodate everyone’s dental needs. Using state-of-the-art medical equipment, we provide the absolute best dental care in the area. When you visit us for a dental checkup, you’ll feel comfortable knowing your health is in the hands of experienced dental professionals. Our staff has extensive experience providing top dental care for patients of every age. This experience is apparent in the quality of our dental services and the importance we place on patient comfort. Many people fear going to the dentist because they are afraid the procedures will be painful. Let us put those fears to rest. Due to the advancements made in medical technology, root canals and other procedures that people used to fear are now virtually pain free. 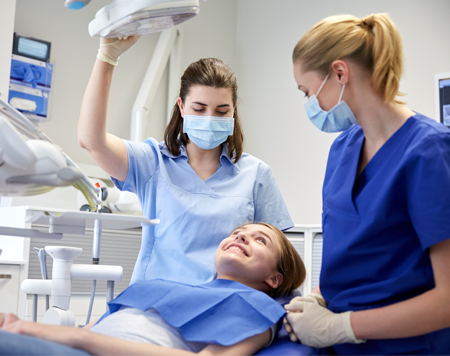 Even a routine cleaning from our dental hygienist is now a much more comfortable and pleasant experience. These improvements are extremely important for our family dentist practice. We understand that for people to maintain good dental hygiene, they need to receive professional dental care at a young age. Our team has the experience and resources to ensure children feel completely at ease when they come to our office. This in turn helps them establish a regular dental routine that keeps their smiles bright and healthy throughout their lives. Contact us today with any questions about our dental services. We welcome patients throughout the greater Raleigh area, including North Raleigh, Research Triangle Park, Cary, Morrisville, Knightdale, Durham, Garner, Apex, and Holly Springs, North Carolina.